Like any other wild critter, turkeys react and adapt to human hunting pressure. A Wisconsin Eastern on public land will be much harder to hunt than a South Dakota Merriam’s on a sprawling ranch. The difference is pressure. That’s easy to understand. The manner in which turkeys change their behavior in response to pressure is more complicated. Turkeys are a prey species and are “pressured” every day by critters trying to kill and eat them. They rise above that, of course, because of their amazing survival powers: great hearing, tremendous eyesight, a paranoid mindset and the physical tools to escape in a flash. Basically, a big chunk of a turkey’s personality is the result of eons of pressure. So how do humans pressure turkeys and make them tougher? Many folks blame calling, but that isn’t true. Turkeys don’t become wary of calling or avoid bad calling. After all, they hear turkey noises every day of their lives — much of it is so bad it wouldn’t get past the first round of your local calling contest — from other turkeys. Further, turkeys cannot reason, so they simply don’t equate bad box-calling from a pop-up blind with predators. That’s just another noise in the woods to a turkey. 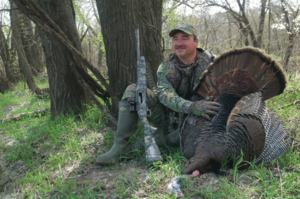 As turkey hunting guru Ray Eye has said repeatedly, “Turkeys do not get call-shy. They get people-shy.” They react after being bumped, boogered and spooked by two-legged menaces. When hunters hit the woods, they often bust turkeys out of trees, spook strutters in fields or startle breeding flocks while stumbling through the woods. 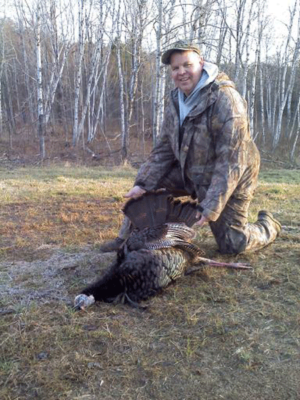 After a day or two of such encounters, gobbling seems to decrease, and hunting gets tougher. Studies in Missouri and other states back this up. Because hunters were calling to turkeys during this period, they often equate the decrease in gobbling and success to birds becoming call-shy. But remember, the birds have heard all those noises before and are not reacting to lousy, incessant calling from boxes, slates and diaphragms. Rather, they’re reacting to avoid all the new two-legged predators in their home range. I can hear some of you now, saying, “Hold on! I drive past turkeys every day or see them while walking the dog, and they just sort of let us pass by.” True enough, but that’s because turkeys have learned to discern the difference between humans passing by at a safe distance from humans acting in a predatory manner. So, turkeys in a field will often let you drive slowly by and wait for you to pass, those turkeys will act quite differently if you park the car and crawl toward them in the ditch. You’ve changed from an everyday encounter to an immediate threat. Of course, there’s another obvious reason why turkeys get tougher as the season progresses. Many of the eager jakes and gobblers are dead. You don’t have to kill too many male birds from a specific area to change the scene. That’s an extreme oversimplification of turkey population dynamics, but the basic principle holds true. Many folks debate how turkeys react to pressure. Often, they believe a decrease in gobbling or turkey sightings means spooked turkeys have left the area, but that ain’t so. Turkeys have relatively small home ranges, and even birds that are spooked out of their minds rarely leave those home ranges. Why? According to noted turkey expert Lovett Williams, a turkey would gain no biological advantage by leaving its home range. After all, it knows its home range like you and I know our back yards, and instinct and experience have taught it how and where to avoid predation within that area. A turkey would be unfamiliar with a new area, and even though relocating might let it escape immediate danger, the bird would face new and unfamiliar threats in its new home. The bottom line is that pressured turkeys don’t go anywhere. They might shift locales somewhat within their home range — perhaps roosting in different spots or avoiding areas where they were startled or shot at — but they stick close to home. And yes, they probably won’t gobble as much or be as visible while pressure persists. But remember, if turkeys stopped being turkeys — that is, gobbling, yelping, breeding and feeding — after being pressured, there wouldn’t be too many of them around. Pressured turkeys are still turkeys. They will feed, strut, breed and, yes, gobble when the mood strikes them — probably after the perceived threats to their well-being have let up somewhat. So if they’re still in the area and still behaving like turkeys, you can still score, right? You bet. I’ll be honest: There are no secrets for killing hard-hunted turkeys. It’s just like Turkey Hunting 101 — but magnified. Think before you act, and analyze every move you make. Further, rely more on basic skills and common sense than gimmicks or crazy tactics. First and foremost, redouble your scouting and reconnaissance efforts. As we’ve established, pressured turkeys don’t go anywhere. They might avoid certain areas or behave a bit differently, but they’re still in their home ranges. Get out there and learn what they’re doing. Find good vantage points, and listen for birds during mornings and evenings. If you establish roosting patterns or, better, nail down a consistent roost, you’re well ahead of the game. Glass fields and open woodlots during the day. Try to see where birds go later in the morning, where they loaf when the sun comes out and where they feed in the evening. After you learn a couple of pieces to the puzzle, you can combine that with your roosting info and begin to formulate a game plan. If turkeys simply aren’t vocal or visible, look for other telltale signs of their whereabouts. Seek droppings, scratching, feathers, dusting areas and the like. Be careful in the woods, though, as bumping spooked turkeys will only make your quest more difficult. My advice for calling to pressured turkeys will sound idiotic, but here it is: Go ahead and call to them, but endeavor to be a turkey. That is, let the birds be your guide on how much and how aggressively you call. Be conservative with roosted birds, and after they hit the ground, take your cue. Are hens yucking it up and gobblers hammering at every faint noise in the woods? If so, they will probably be fairly responsive to calling. As always, start softly and sparingly, and ratchet it up as needed. It’s more likely that pressured turkeys will be fairly soft-spoken. Gobblers will likely talk a bit on the roost and substantially less after hitting the ground. Try to get a fix on his mood by sounding like a hen going through her daily routine. Hit him with some soft clucking and purring and perhaps a few soft yelps. If that doesn’t seem to work, try some louder yelps and a bit of cutting. If the bird ultimately acts disinterested or drifts away, don’t hammer him with incessant calling. Refer back to your scouting, and try to find a better setup. Let the birds do their “turkey thing” — feeding, breeding and the like — and hope hens leave the gobbler later in the morning. Find the best setup possible, settle in, and be patient. There’s one final way to beat a pressured turkey, but it’s very difficult. Leave him alone, let him get back to normal, and hunt him later. For some folks, this isn’t an option. If you can only hunt a 40-acre farm or small wildlife area near your home, you’ll likely be after that pressured turkey as often as possible. But if you have multiple spots or lots of acreage, it’s wise to leave pressured birds alone for a while and chase them later. How long? That depends on how hard the bird has been hunted and the turkey itself. Sometimes, a day or two is plenty. Other times, a bird won’t “get right” for an entire season. There’s really no way to know in advance how a bird will react. Leave a hard-hunted turkey alone for a few days, if possible, and then try him during an ideal morning. If he acts better, you’ll feel like a genius. If he’s still tough, try not to make matters worse during your hunt, and consider giving him some more time off. Hard-hunted turkeys represent a microcosm of turkeys in general. The birds are typically difficult and hard to kill. You must be on top of your game and use your head to succeed. Take that philosophy to another level, and you have your formula for killing pressured turkeys.